It all started when I was 16 years old and a high school senior in San Pedro, California, a suburb of Los Angeles. The year was 1962, and apart from a few stereotyped notions of judo and jujutsu, the average American knew virtually nothing about Japan, let alone Japanese martial arts. Even karate was still largely unheard of, and for most of my countrymen, could just have easily been the name of another Japanese dish, like “sukiyaki” or “yakitori”. In any case, on this particular spring day, a demonstration of an unknown martial art called “aikido” was to be held at my high school. All the teenagers present, myself included, were captivated by the marvelous display of dynamic techniques replete with joint-locks and spectacular falls, the likes of which they had never before witnessed. Since I regarded myself as rather weak physically, this strange oriental fighting art instantly captured my imagination. Visions of an all-powerful warrior (me!) repelling multiple attackers with the mere flick of a wrist lept tantalizingly into my mind. Finding myself more than just casually interested in this mysterious art, several days later I went with a few equally curious schoolmates to the nearby dojo where aikido was practiced for a first-hand look. On that occasion we requested the teacher try out some of his techniques on us. He smilingly obliged and applied kotegaeshi, nikyo and sankyo to each of us in turn while we writhed in pain with each successive technique. Convinced of the effectiveness of aikido techniques, we watched the practice and I promised myself I would someday have to give this martial art a try. 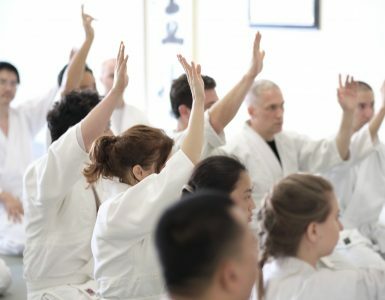 Back in school, however, the intense first impressions of aikido quickly faded and my thoughts were focused on more pressing matters—graduation and girls—although not necessarily in that order. That school semester quickly ended and summer vacation began in southern California. I took a part-time job to earn some spending money and felt like a young prince finally being able to drive around town in my own car. Then one warm Saturday evening in August, I experienced an event that jolted me out of my secure adolescent world. I received an invitation to attend an outdoor party from a high school friend and eagerly accepted. When the appointed day arrived, my expectations were not disappointed, and I found myself enjoying the party immensely. Suddenly at about 11 pm, our pleasant reverie was interrupted by rocks sailing into the yard from out of nowhere! Our innocent fun turned to confusion as all those present began scurrying inside to avoid being crowned by an airborne object. Just at that time, I noticed one of my friends—a somewhat overweight young man of Italian descent with a beautiful tenor voice—head out into the street to investigate. I started after him also wanting to put a stop to this “party crasher.” This “party crasher” turned out to be ten young thugs known to all of us who had been drinking and were obviously bent on starting a fight. My friend Gus marched right into the clutches of the gang of ten to protest their conduct. They immediately encircled him, closing off any route of escape. I approached, too, but the momentum of events had already accelerated and poor Gus was, in reality, quite on his own. Gus really surprised me at that point by talking boldly despite his predicament at being outnumberd ten to one! The leader, a guy named Mike, was clearly itching for a fight and soon the punches flew. Gus once again amazed me by holding his own in this exchange of fists, and at one point even looked like he might come out on top. Apparently, Mike’s friends thought so too, and two of them proceeded to sneak up behind Gus and seize his arms. From then on, Mike proceeded to bloody Gus’ face and break his glasses with the assistance of his two cohorts. The others in the group stood by laughing and I frantically attempted to lend my feeble support. Unfortunately, or maybe fortunately, considering my nonexistent fighting skills, I was prevented from interfering with their fun by two of the remaining “bystanders.” Helpless, I watched in horror as Gus ended up on the ground with blood trickling down his cheek. If I could only have helped! Mercifully, the slaughter soon stopped as Gus had obviously been beaten, and the ten left as suddenly as they had come. I helped the dazed Gus up and we went back into house and attempted to patch him up. That night my blood began to boil and I swore I would never again allow such a thing to happen in my presence. Then I remembered aikido! 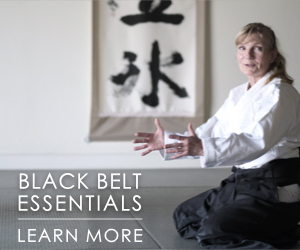 Yes, that was the answer… aikido! Three days later on the third Tuesday of August 1962 I enrolled in the nearby dojo. That act changed my life. The aikido dojo was operated by a 28-year old man named Virgil Crank. He was a short but sturdily-built fellow with blond hair. He had good sharp technique and was a nidan in Yoshinkan Aikido. It turns out he was also a hero of sorts having single-handedly lifted up the bumper of a car to allow a trapped woman to be pulled free. This was a Yoshinkan-style dojo, and consequently the first Japanese aikido master I learned of was Gozo Shioda. There were perhaps 20 students attending regularly and the first night I was treated kindly and shown warm-up exercises, the rudiments of breakfalls (ukemi) and a basic technique or two. 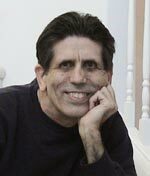 It felt wonderful exercising my body in this new way and little by little I began to gain some confidence as I acquired an understanding of a few techniques. My high-school friends were, however, less than overjoyed at my progress in aikido. Naturally, I used their unwilling bodies and arms as my training ground and soon no one would shake hands with me for fear I would apply a kotegaeshi! 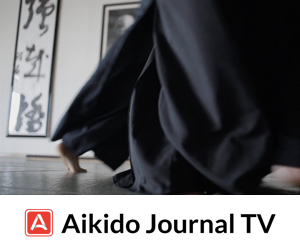 Since there were no more than a handful of aikido dojos in the continental U.S. at that time, students were rapidly promoted and drafted into participating in demonstrations. I can remember several occasions, after only a few weeks training, when I was asked to participate in public exhibitions of aikido and my carefree young body was served up as cannon fodder for my instructor and seniors! It was really exciting to find myself on stage performing a martial art when just a few months previously I was in the audience as a spectator. Near the end of that same year 1962, financial difficulties were plaguing the Yoshinkan dojo and it became apparent to us all that the school would soon close down. As luck would have it, one of my fellow students took me along to our local YMCA where an aikido class was being held twice a week. I joined that group shortly thereafter and it was there I met Isao Takahashi Sensei. He was a middle-aged nisei Hawaiian who spoke English with an accent having lived in Japan as a boy. 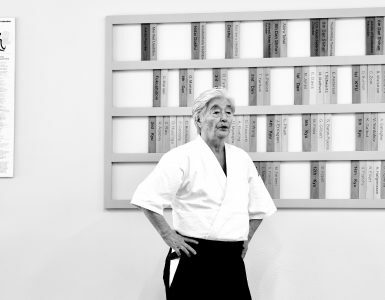 Takahashi Sensei had dan rankings in aikido, kendo and judo and was very much an inspiration to me in my early years. He had first studied aikido in Hawaii in 1953 learning from Koichi Tohei Sensei and was a top martial artist on the islands. 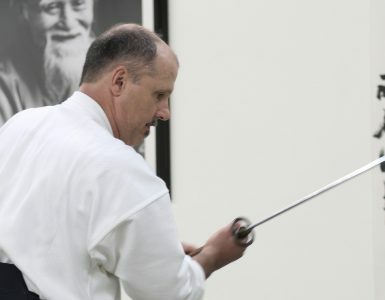 He relocated to California in 1960 to head the Los Angeles Aikikai. I remember he would always write kanji on the blackboard to explain aikido techniques and concepts to the class. I would watch in fascination as he formed the graceful characters in chalk and this was the seed that later led to my studying the Japanese language. 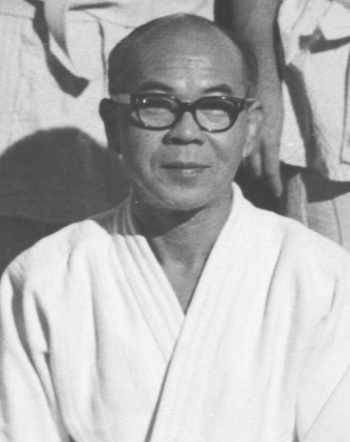 Takahashi Sensei’s style of aikido was more fluid than what I had first learned and was heavily influenced by Tohei Sensei’s pedagogical approach with an emphasis on ki. In April 1963, Second Aikido Doshu Kisshomaru Ueshiba, who was visiting the U.S. for the first time, taught a class at our YMCA. It was a special day to be able to meet the soft-spoken son of the founder of aikido in person. In 1964, we also had visits from Yoshimitsu Yamada and several Japanese university students. I’m sure the Japanese students departed somewhat in dismay as I managed to tear the hakama of two of them with my big feet! Later, a young man named Terry Dobson who had lived among the uchideshi at the Aikikai Hombu Dojo for a couple of years came to train with us. These are some of the events that most stand out in my mind from the early years. Nonetheless, very soon I was to meet and train under the famous aikido master Koichi Tohei, and I will relate my impressions of him and more on the early years of aikido in California in my next article. Stan Sensei – what year was the photo with Kisshomaru Ueshiba Sensei with you in the background taken? Can yu identify anyone else in the photo? April 1963 at the San Pedro YMCA. 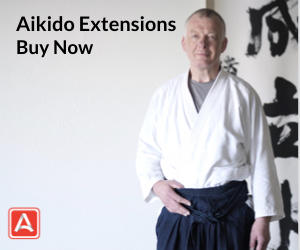 Thank you for sharing your personal aikido history with us, Pranin Sensei; I look forward to Part 2! 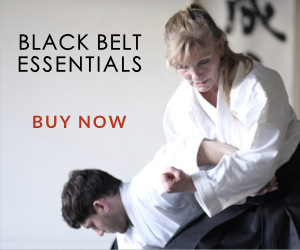 I never have seen you wearing a white belt before. Thank you guarding countless treasures, found along your way. I love walking,/reading in aikido wonderland, you created. Keeping so much legacy alive..